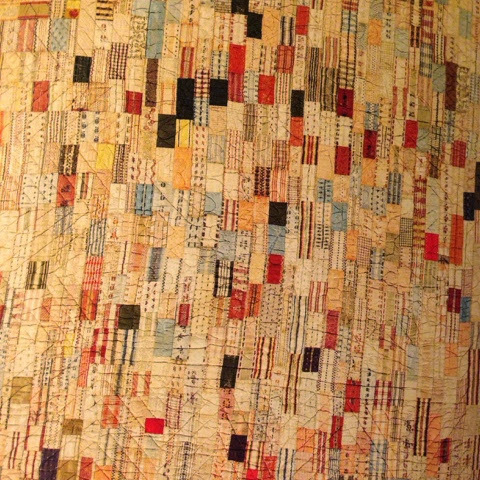 The top picture is of a quilt made in the mid 1700's. Isn't it just gorgeous? I love the colours, the haphazard feel of it, how incredibly modern it looks (it's even quilted in chevrons for goodness sake). I love that it is obviously made of pieces of genuinely scrap fabric, mostly silk, that would have been way too precious to discard. 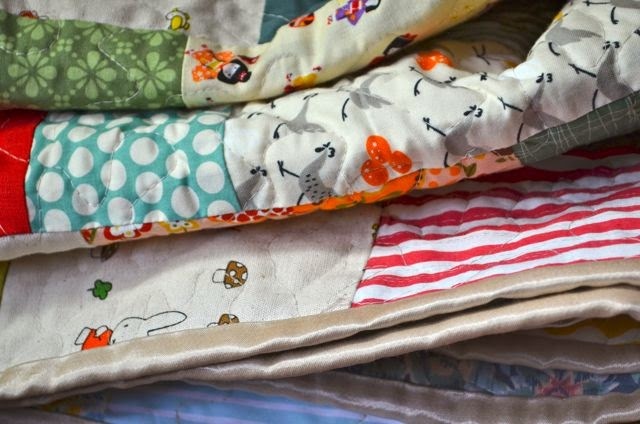 Then I read this post and found it so perfectly in tune with both my quilting and general crafting philosophy. 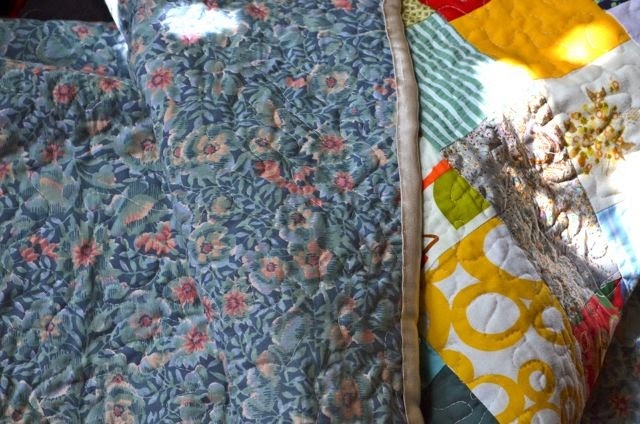 I love how she says that her quilts are put to hard use, that they have to withstand all manner of rough treatment. Inspired by these two things I decided to make a quilt for an as-yet-to-be-determined purpose. 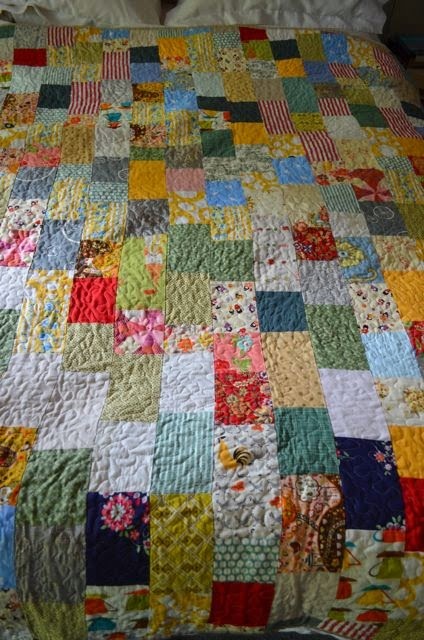 I would use only scraps, I would chose only a general colour scheme, I would not plan it out, I would not even lay it out, I would follow no pattern, I would trust in chance. I spent two evenings in front of 'House of Cards' cutting out strips of fabrics from my scrap bags. They are all 4.5 inches wide (give or take) and varying lengths depending on what was available. I decided on yellows, blues, greens and reds, with twice as many yellows as any other colour. There are a few greys and pinks in there too. After cutting all the strips, I put them in piles according to colour. The cutting and sorting took two evenings. 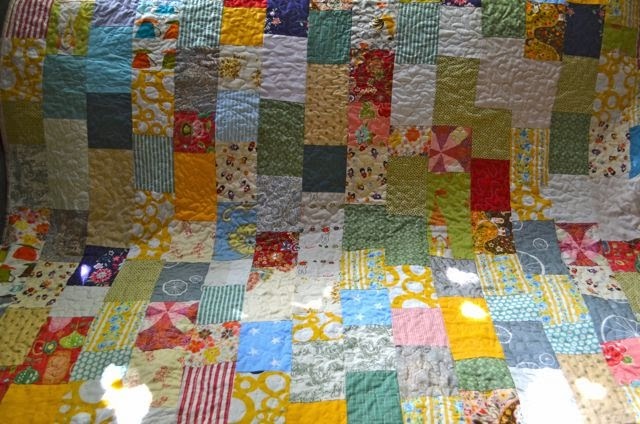 I then spent two evenings piecing the quilt. I had the piles of fabric by my machine and I chose from each pile fairly randomly, making sure only that I used more yellow than any other colour and that I didn't stick to any consistent order in selecting from the piles. I chose between 18 and 20 pieces per long strip, but didn't measure anything, just judged the appropriate length by eye. After two nights I had pieced all the long strips and joined them together to make the quilt top. Do you recognise the backing fabric? This is a cheaper rip off of a Sheridan sheet set that was hugely popular in the late 1980's and early 1990's. I remember coveting it on Sarah Walker's bed at college. I finally bought a version myself and I reckon had it on my bed in extremely high rotation for the better part of a decade. I've had that doona cover and pillow case set for about 25 years now and I'm pretty over it. I don't think I've used the doona cover in a good many years, though it remains in perfectly respectable condition. So I was more than happy to cut it up and put it to use as the backing fabric. I still think it is quite pretty. I spent two evenings quilting in a free motion stipple. I ran out of thread about half way through or I might have powered on through and finished in a night (though it would have been a late one). I spent the seventh evening binding it in an old shot silk of my grandmothers. My grandmother was a strange person. Every few years she'd take herself off on a cruise to somewhere in Asia and come back looking several years younger. I guess in her penchant for plastic surgery she was ahead of her time, but not in a good way. When she died I got a box of fabrics, many of them bought in Hong Kong with prices and tags still attached, bought for a purpose in mind that had never been realised. There was a good length of Laura Ashley fabric which I used to make a couple of little dresses, one of which still fits Lily. There were pieces of faux suede and seersucker and something that had been destined for a dressing gown that never materialised. There are still some rather lovely pieces of silk and one day perhaps I'll make use of them. Our friend Paula used some of the fabric to make the most gorgeous party dresses for Ruby and Nina when they were tiny but she really is a seamstress who knows what she is doing. One evening didn't quite see me get all the binding on (I handstitched it), so the morning after Grace's party, when we all had a bit of the inevitable post party blues, I finished it at the kitchen table while Lily drew carrots reflecting in the sun, and Nina made a jigsaw puzzle (not did a jigsaw puzzle, made one), Ruby practiced 'Scar' on the piano which she is playing and singing for her piano concert and Grace made a bookmark to put in her new picture version of her (so far) all time favourite book, 'The Enchanted Wood'. I'm very happy with it. It is rough and uneven and imperfect and I want to make a whole slew of these. I love it too. 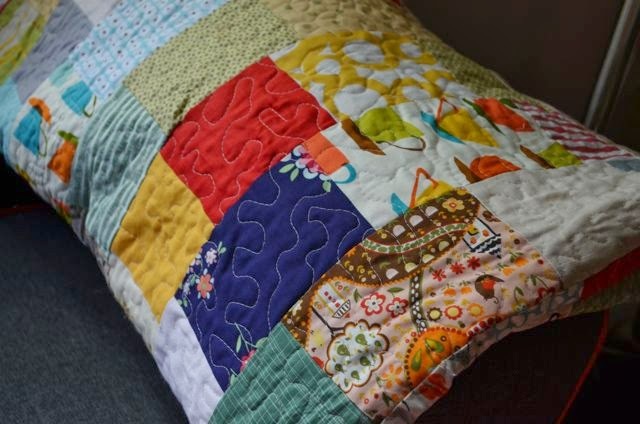 Think it's my favourite of all your gorgeous quilts. Oh it is perfect! And inspired. I love it Julie, thanks for sharing it, and the process of it, with us. like you with your piles of fabric. sewing together everything you pull out in pairs. It would be letting go of too much control for me! Love it, both yours and the 18C one.